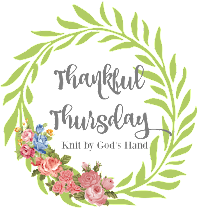 Knit By God's Hand: Christmas Tag... full of fun questions! 1. What's your favorite Christmas tradition? Going to church on Christmas Eve. It's just special to me... & I always end up crying at some point during the service. "Christmas" to me is spread over so much more then 1 day, so lots of places to go & visit - but on Christmas morning, its Ricky & I just enjoying an easy morning. I like to make a big breakfast & then we open gifts from the two of us & then its usually us playing with our 'big toys' - that translates to us trying to figure out how all the new electronics really work. Then we go to my parents for Christmas sometime in the afternoon.... I always hate that we usually have to work the next day so Ricky usually wants to get home to get to bed early - but this year, its on a FRIDAY! YAHOO!!!! If Thanksgiving is late in the year, I like to try & do it the weekend before Thanksgiving. If its earlier in November, I usually do it on Black Friday. But my tree is ALWAYS up by Thanksgiving weekend. It's too much work to not be able to enjoy it for awhile & since we're usually shopping on Black Friday, I like having my tree up so I can start wrapping & stacking. Well, this is a Sophie's Choice question, isn't it? ... I always think of that... "if the fates allow"... its a blessing to see anyone & everyone every year. I guess I actually do - & not one that I bought for the point of an ugly sweater - I think its a legit old sweater. Actually, its a long sleeve shirt ... that I made when I was in high school... with puffy paint. Truth. I find it hanging in the back of my closet every year & I cant make myself throw it away or give it away. I'm going to pull it out one year & totally win a ugly sweater contest with it. It doesn't feel like Christmas to me unless I make at least one time during the season, melted Vanilla cream chocolate drops melted on crackers. My dad used to make these when I was little & they just remind me of being a kid again - I guess its why I like to do this during Christmas. You just smash one flat, put on a cracker, put in the microwave for just like 10 seconds & they melt on the cracker... its DELISH - the salt from the cracker & the sweet from the drop. Oh man. I gotta keep my eye out for these babies now! I'm not a huge peppermint flavored person, but I do love peppermints. Just plain ole peppermints. Or those soft peppermints? mmmmm..... I don't mind gingerbread either but as long as its covered in frosting. So I'll just take this one as a tie. I have... & for some reason, I don't remember it being as awful as everyone claims it to be. I think its because my grandmother made "Fruit Cake Cookies" & they were basically the same ingredients as the cake, except baked in cookie form. I liked the walnuts & dried cherry combo. I also haven't eaten those in about 20 years so I may actually not like fruit cake at all now. Who knows. 11. What is one thing you have asked for for Christmas? I haven't asked for one thing.... I don't need anything - I have all I need. let me take that back - I jokingly (not really) ask for new faucets on all my sinks every year. The hubs thinks its funny .... but I honestly want new faucets on all my sinks. Our sinks either all have COLD labels on the faucets - or nothing at all. It's actually pitiful & sad. If I ever woke up on Christmas with new faucets - or even ONE new faucet - I would truly believe in Santa & Christmas miracles. well, this is just a given for me, right? So what are some of your answers? 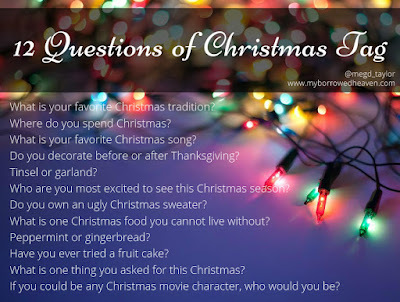 Feel free to play along - Grab the questions & let's see how you do Christmas! Let me know if you play along so I can read your answers! I love those chocolate drops, but I've never tried them on crackers. They remind me of when we were little and On the last Sunday morning before Christmas we'd get a bag of treats, a candy cane and a piece of fruit. Most was hard candy but there would be 1 or 2 of the chocolate drops. They were always my favorite back then. my mom is a huge fruit cake fanatic. there's only one kind, made in a tiny town, that she will eat. idon't mind it, but woul prefer it with some icing or something. it's not the holidays to me without my aunt bea's fudge. How fun! My wishlist is the same as yours this year. I did have a nice camera bag on my list - but really...I don't NEED it. I just want to clean out something for Christmas, I am overwhelmed by stuff lately...if I could get one thing clean, I would feel better. What a fun post!!! I love Christmas!!! I just added I heard the bells on Christmas Day to my Christmas playlist on Spotify! 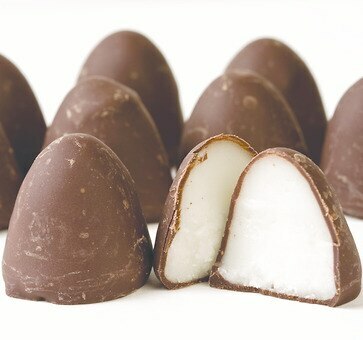 Vanilla cream chocolate drops?! yum. they look delish. 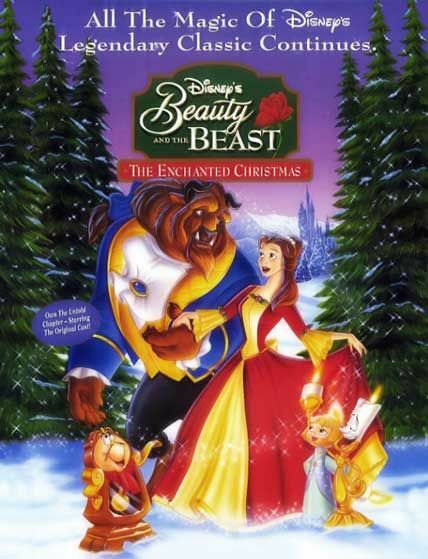 i have never seen the beauty and the beast christmas movie, crazy right?! Christmas Eve church service is my favorite part of the holiday season, too :) And I need to try these chocolate drops, yum!! I don't have much of a wishlist this year; it's too crazy of a year. Hopefully, I can enjoy it more next year. I would never buy a fruitcake, but I don't think it's that bad. I like fruit...I like pound cake, so, seems alright. I have never had fruit cake. I used to always have tinsel on the tree but I got away from it with all the animals and I don't miss the mess. Cory loves fruit cake...I'm always too disgusted to try to it! And we are gonna need to see this Christmas shirt! I've never had a chocolate drop but smooshed and melted into a cracker sounds like the way to do it. My coworker loves fruit cake. We were just discussing this a few days ago. Our tree has no tinsel, garland, or ribbon. I always look forward to our family gathering, going to church on Christmas Eve, feasting on food on Christmas day, opening gifts with loud Christmas songs. I just love everything about Christmas!